De Bary AQUA-UV sterilizers have been developed over many years and offer a clean, quiet and efficient way to destroy harmful bacteria, parasites and floating algae in freshwater and seawater aquariums. De Bary AQUA-UV sterilizers have a large canister volume designed for long exposure time of the passing water to the UV rays. Remove viruses, bacteria, parasites and floating algae without harming beneficial bacteria in the substrate or filter media. No chemical residuals in the water. Simple connection to most canister filters and water pumps. Suitable for commercial and hobby use. 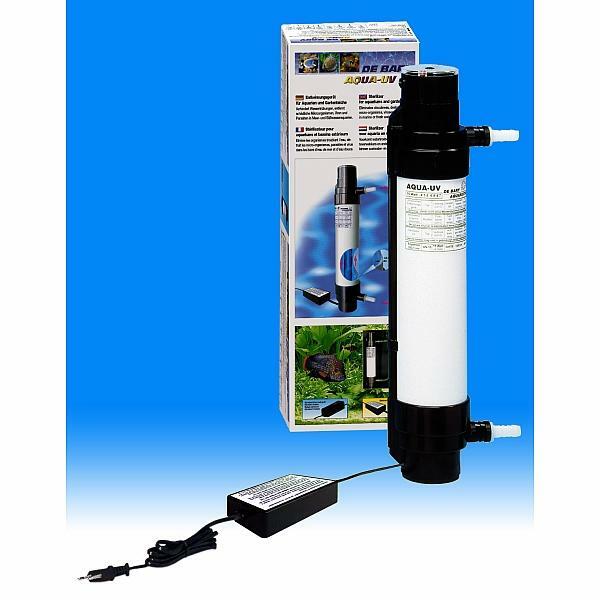 De Bary AQUA-UV 15 watt is suitable for aquariums to 750ltrs. Recommended maximum water flow is 2,000l/h. Supplied with x1 UV Bulb. Replacement bulbs also available instore only. TMC use De Bary sterilisers instore with very successful results regarding disease control and prevention. Feel free to pop in and have a chat to our staff for more information.